So you want a Miniature Schnauzer? Schnauzers are one of the most popular breeds in the U.S. 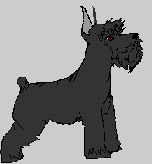 The Miniature Schnauzer is an absolutely wonderful breed. excellent companion. He is devoted, playful, and affectionate. Schnauzer is a very elegant breed.